Owning a grill inspires a passion rarely seen in people who buy outdoor luxuries. From the food that you cook on it to the maintenance and upkeep to ensure it is in pristine condition, grill owners seem to invest the most amount of time and energy into getting the maximum enjoyment from their purchase. 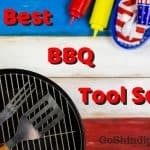 Whether it’s researching rubs for the meats or, as this article will delve into more, buying the best grill cover, so you have an optimal piece of equipment at your disposal, you can always rely on grill owners to make rational, reasoned decisions that will ultimately serve them best in the long run. 2 Why Use a Grill Cover? 3 What are Grill Covers Made From? Garden Home Outdoor offer this bbq cover that ticks a lot of the boxes when searching for the perfect one. Firstly, this grill cover comes in a total of six color patterns and seven sizes. That’s a whole lot of options for you right there. Sizes start from 52 in and go right up to 72in. So there is a wide variety of grills that will be covered by these dimensions. 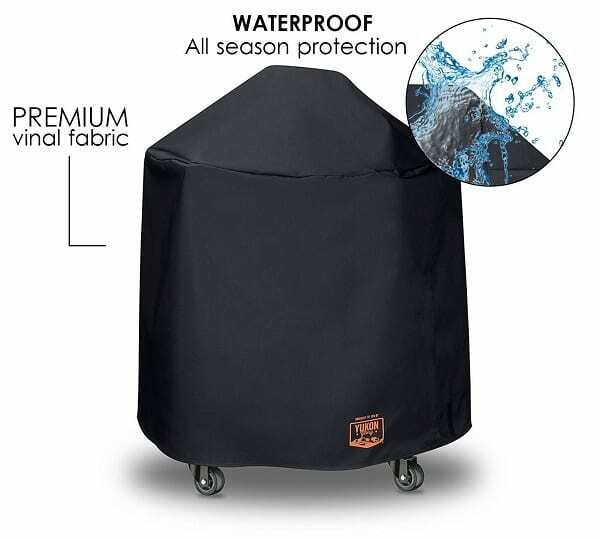 The grill cover also has some cool other features such as the air vents that can prevent build-up of moisture or condensation, straps to help with the battening down process, pockets to keep the grill accessories close to hand should you feel the need and is made from a heavy-duty cloth that is flame, weather and rip resistant. Classic Accessories has been a family favorite option for many years. But has come under increasing criticism for their Veranda range which seems to have changed its materials. Fortunately, the Classic Accessories Ravenna Grill Cover is still using the materials which it has built such a great reputation upon. This range comes in five sizes which go from 58in to 80in in length. This gas grill cover uses a durable woven polyester fabric that boasts fade-resistant properties. There’s also a water-resistant laminate undercoat. There are added features of handles with padding to make removal that bit easier, elastic hem cords to get a properly snug fit and air vents. 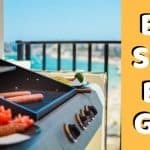 Many people don’t seem to consider that you might require a grill cover for a kettle grill as they are usually small enough to store inside after use. But this is not necessarily the case. First off, the kettle grill might have to live outside for reasons of space. It, therefore, needs a cover that can stand up to the elements. Even if storage was inside though, there are a lot of chemicals in the home environment that can prove detrimental to the grill’s health. 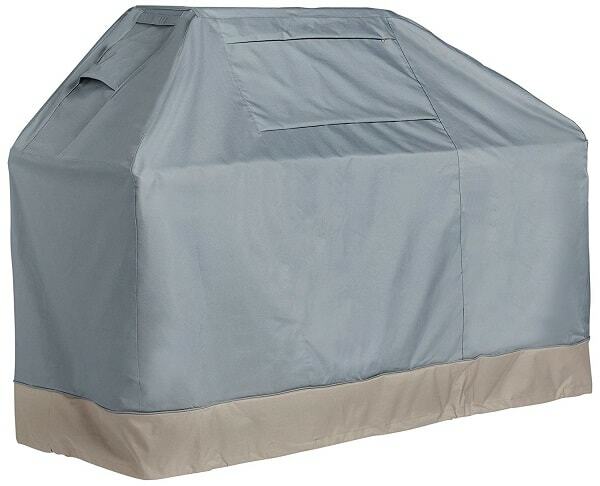 Yukon Glory Premium Grill Cover might be the best grill cover for kettle grills. I’ve seen many people complain about the quality of the Weber cover grills and have issues with weather resistance of many of the other brands. 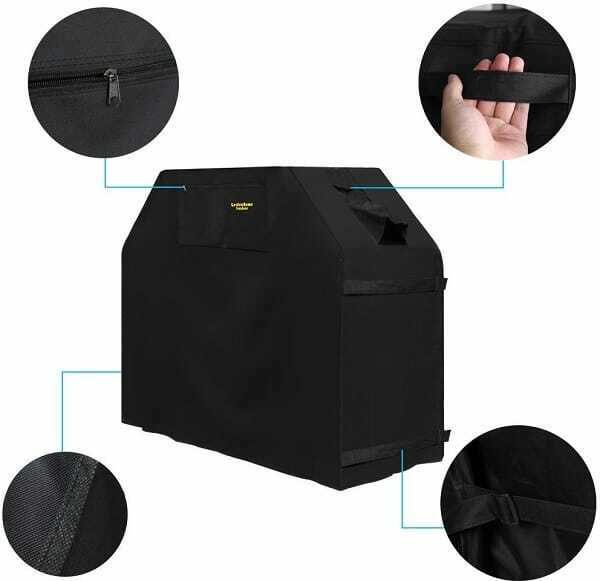 This BBQ grill cover, however, uses very durable vinyl material that is form-fit with Velcro straps and is 100% waterproof. Its primary use is for Weber kettle grills but will fit most 22in grills. Be sure to double check though. VonHaus have a large range of protective coverings and their BBQ cover is probably their most well-received one. The storm collection grill cover uses heavy duty 600D polyester with a waterproof PVC lining. 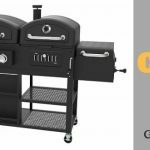 It measures 60in in length and its universal design ensures it will fit most medium sized BBQs. Added features include air ventilation, elasticated hem with drawstrings and also toggles which provide a more custom fit. Although perhaps not as stylish as other covers, VonHaus has a good reputation. Certainly in my experience, for producing quality products so it is perhaps something to consider if the aesthetics are a problem for you. Why Use a Grill Cover? Leaving your grill open to the elements opens you up to no end of problems. Prolonged exposure to the sun, rain, snow or even wind can leave your BBQ at risk of damage. Even if it is thousands of dollars worth of equipment that you assume will have built-in protection. 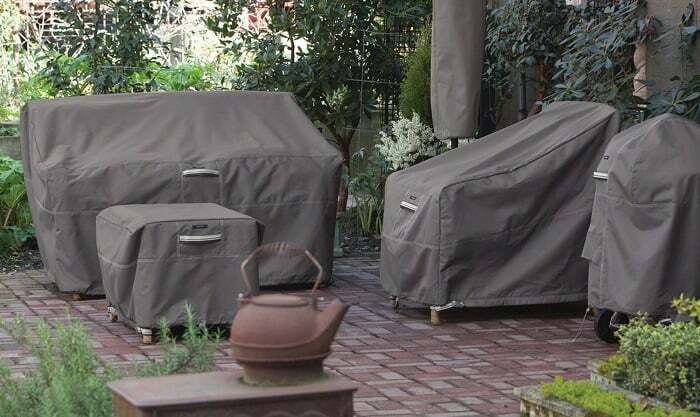 The best grill cover, therefore, is the barrier between the elements and your grill. They stop potential threats that not only include the elements, but things such as large wildlife making winter nests, dust, pollen, and general waste. To surmise, the best grill cover will prolong the lifespan of your grill by shielding it from anything that might do it harm. What are Grill Covers Made From? You will see grill covers made from almost anything if you look hard enough. 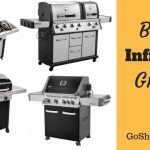 But for commercial grill covers, you will probably notice that manufacturers will use three different kinds of materials. Polyester – Probably the most common grill cover you will come across. It has certain advantages such as being lightweight, easy to clean and hugely versatile. Polyester grill covers will stand up to almost all weather conditions. Durability is sometimes a factor that will let these covers down. Vinyl – Vinyl grill covers offer great protection from rain and snow as they are highly waterproof. Durability questions also arise from time to time with these covers. So if a vinyl grill cover is really what you want then I suggest opting for the thicker versions. Canvas – Canvas grill covers use the same materials you will find in things like tents and awnings. They are very good when exposed to the elements and normally come at a cheaper price than the other options. Even though they offer better durability in many cases. The best grill cover might seem to many as just a fancy piece of tarp. But there are many intricacies separating standard covers from very good ones. Lining – The grill cover lining is probably the most important feature you will want to take notice of. It is this lining that gives the cover the resistant properties that are so desirable, such as weather and rip. A good quality lining will aid in the prevention of damage caused by external forces and will extend a grills lifespan. Materials to look for include PVC, polyester and nylon. Whilst ones to avoid include wool or fleece that can prove difficult to clean and dry. Straps – Grill covers with straps can prove to be a very useful addition. Their primary purpose is to keep the cover in place in windy conditions. This happens by creating as snug a fit around the BBQ as possible. Whilst this offers excellent protection from the wind, straps can also aid in the prevention of any unwelcome guests. Any number of wildlife would like an element free home for the winter but the straps will be able to keep the majority out. Air Vents – Grill covers with air vents will help eliminate the build-up of moisture and condensation in your BBQ. There will normally be a pair of vents that will allow air to circulate keeping all the enclosed contents fresh and not stale. Air vents can also act as a blocker to your grill cover ballooning by allowing trapped air an escape route. Pockets – If the grill cover is just for overnight use then you might want to keep your grill utensils close at hand. Grill covers with pockets aren’t exactly going to win many innovation awards. But for some people, they will be a lifesaver. Looking after your grill cover will obviously help you prolong the lifespan of your product. Fortunately, this is a fairly straightforward process. If you are able to regularly clean your grill cover then a wash down with soapy water and a hose should suffice. If there are long periods in between cleans then I would suggest a thorough scrub. Get into all the corners and areas where there is a concentration of stitching. Periodically, roughly every 3-4 months, I would also suggest using an anti-mildew spray. This will prevent any subsequent damage caused by the fungus. We have anew Weber Grill that came with a cover that is great (I think it’s polyester). Does any other company make covers of similar material for a loveseat, an armchair and an ottoman?